Nozzle flow rate of 88.2l/h/100bar –>43% increase compared to to stock. 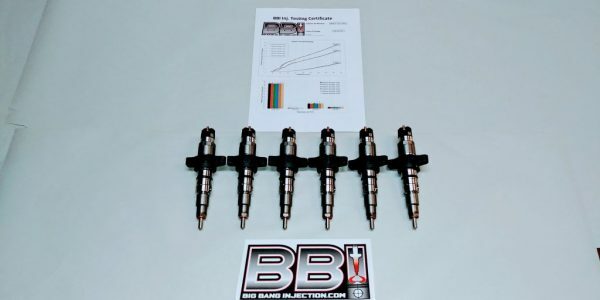 These injectors are capable of up to 850 rwhp. Injection quantity reduction is a simple adjustment, thanks to Smarty. Decrease fuel quantity to satisfy the needs of your current set up, or crank it up to 850 RWHP. Twin turbo chargers are suggested. These internal alterations add the advantages of better engine response and maximum performance at high rpm. 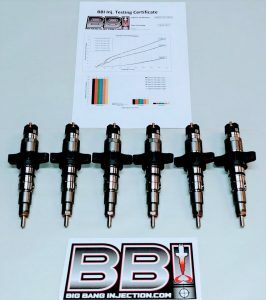 WHAT DOES CHANGED INJECTOR ADJUSTMENT PARAMETERS MEAN AND WHAT ARE THE DIFFERENCES TO THE INJECTOR BODY UPGRADE? It means, that the injector get completely disassembled, all necessary adjustment parameters will be changed and some parts will be reworked to get the maximum power out of the injectors. Every injector Stage has it´s own adjustment parameters to guarantee their perfect function. The injector body upgrade is a change of the hydraulic setup of the injector. It is making the injector much faster at opening and closing. So you will get a higher injection quantity in a shorter amount of time into your combustion chamber. This is essential if you want to achive high HP levels at high rpm´s.